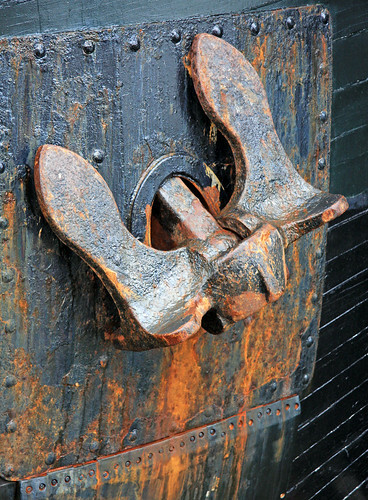 HMS Bounty Anchor, a photo by Canon John's 7D (1,000,000+ views, Thanks) on Flickr. Épice Marine arrived after much anticipation (it's about 4 months late) to the Hermès boutique on Burrard & Alberni in Vancouver. The name alone, suggesting a study in contrasts, promised intrigue; and ocean being one of the greatest sources of inspiration for me, I was very much looking forward to experience Jean-Claude Ellena's take on it. The piracy goes deeper than that briney scene at the deck: the composition is a mirror image of Edmond Roudnitska’s first perfume for the company (and now sadly discontinued) - Eau d’Hermès. It is no secret that Jean-Claude Ellena is infatuated with this Roudnitska creation, and in Terre d’Hermès it was explicitly stated. Of course influences are fine - especially when the nose in question was the student of the great master. Besides, being an Eau d’Hermès lover, why should I care if there is a similar perfume offered by the same house? The reason is, that there is something a bit off about this scent. It does not feel balanced, the use of calone make it smell generic and lackluster. And to me this feels almost like a mockery of the original, rather than an homage. Once the confusing impressions of this perfume's opening lines fade away, I'm left with a very generic marine scent that sort of has a presence just enough to distract me occasionally, but never to delight or intrigue any further. And by the time we get to the dryout, it is very faint already. The notes chosen are not the issue. It's the composition and the harmony - if only there was more room for the seaweed absolute and oakmoss to speak up, the saltiness of the dryout would have been more prominent, evocative and memorable. Seaweed absolute is an extremely difficult note to work with, but I still wish it had more presence. It would have made this truly a piece of art, rather than a conceptual, light and crowd pleasing fragrance. I realize this is not the style that Ellena is after with the Hermessences, but in this particular case it feels like a missed opportunity. Épice Marine is perhaps the only perfume that's truly intriguing in this collection, telling a story that can be relatable to others besides the creator and with fascinating raw materials to paint that picture. It has all the making of an interesting perfume, except that it doesn’t work. Fascinating short documentary with composer Stuart Mitchell in Edinburgh, who dedicated the past 10 years of his life to translating the DNA codes of plants into musical frequencies. The film focuses on the code that's responsible for the scent of rose. The code is than arranged for accustic instruments - in this case the composer felt that the scent of rose is most accurately portrayed by the sound of flute. Thank you to Shelly Waddington for the hint! The most touching perfume commercial I've seen in a while! Directed by Giuseppe Tornatore (Cinema Paradiso). It brings a fresh and convincing angle to romance, courtship and the power of scent that has long been absent from this genre. Oh, and it is for Dolce & Gabanna new perfume "Dolce". I hope it smells true to the movie. Never forget You, a photo by Cereal-Killer 72 on Flickr. These days, I'm working on scent project that are different than perfume. Namely, the clean laundry scent. 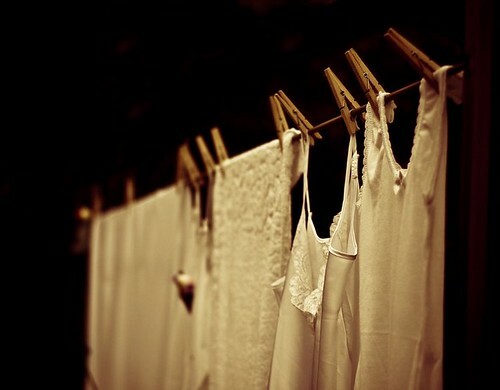 The scent of clean laundry should be crisp, and symbolize renewal. Yet there are so few green options out there. The scent I've created is versatile and can be used both in the laundry cycle (if like me, you are using an unscented, eco-friendly laundry soap); as well as scent reusable dryer sheets or felted wool ball that is used for the same purpose - reducing static, and freshly scenting your clothes and linens. Lavender comes from the Latin word "Lavare", to wash, and has affirmed its association with linens and cleanliness. However, there is nothing original or particularly interesting about it, not to mention it is very fleeting. Therefore, I've combined lavender with other essences that will make the laundry smell fresh yet soft and comforting. The scent will become available in April 2014, that you too can enjoy a green, clean and fragrant spring! "Sabotage — sharp like a blade, like a sardonic grin. Bitter, sour and spicy to the point of a grimace. cynical jokes, evil glare. Ayala calls it a parody – and it is. A whimsical portrayal of a typical romantic character: a villain with a sharp tongue, who’s hiding his tender and wounded soul". 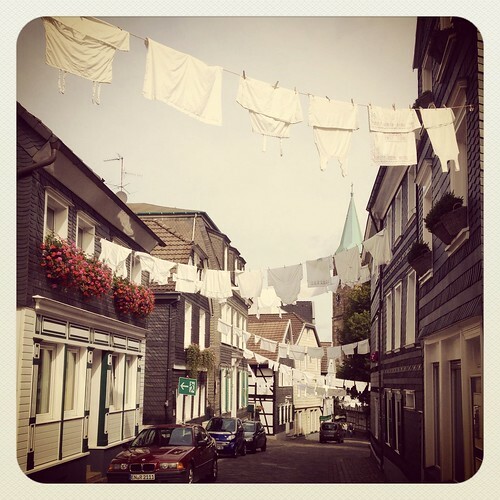 clean laundry, a photo by Belouni1012 on Flickr. Modern laundry scent engineering is quite sophisticated. Scent that is designed for laundry has to not only smell enticing from the bottle (most consumers make their choice of laundry detergents based on the scent, right in the household products isle); but also withstand the laundry cycle. This is possible thanks to micro-capsule technology, which means the scent is entrapped in microscopic capsules that will only release close to when the laundry cycle is complete, or - more sneakily, after the laundry is done (so that the scent keeps getting released long after the washing process is complete). But is this laundry truly clean? I think not. While this still does remove the dirt and grime, it replaces them with chemicals that are likely just as harmful as the bacteria and mold that your washing machine has worked so hard to clean. Another unfriendly component of many laundry scents, is polycyclic musks, which have replaced nitro musks and are used in nearly all scents in the mainstream fine fragrance world, as well as in functional fragrances. Not only do these musk retain their scent for long after the washing is done; they also never break down in the environment, creating sediments in our water sources. They accumulate in the bodies of many organisms, including human beings, creating hormonal disruptions, as well as reduce the body's ability to protect itself against toxic chemicals. Musk molecules are so persistent and have become such an inescapable pollutant that they have been found in nursing mothers' milk and in infants. While nitro musks' carcinogenic and health hazards have been long recognized and lead to them being banned, polycyclic musks effects are still largely unknown, and we only now begin to find out how they affect our health as well as the environment's. Do we really want to wait and find out the hard way? I for one have stopped using synthetically scented body products and functional products. The laundry dryer sheets were the first to go. As well as scented laundry detergent. My laundry smells fantastic, simply by washing and drying it. And when I want to get rid of some greasy, moldy and other foul smells (usually accumulating in my kitchen towels), I add essential oils with solvent properties (such as coniferous and citrus oils) that and those that fight bacteria and fungi (i.e. : tea tree and eucalyptus). If you live in a rainy place like mine, where laundry never dries up on a clothes line, adding a few drops of essential oil such as lavender on a wool felt ball or a cloth and adding it to the dryer cycle will add a fresh and environmentally friendly scent to the laundry if you so desire. And of course you can add a true lavender scented linen spray if you iron your clothes. Your laundry can smell good without risking your health and ruining the environment on the way! The New York Times' T Magazine ran an interesting article that explains today's consumer's fragrance promiscuity. Can you relate to this theory? Do you also shape your memories and eternalize them by associating perfume with certain periods in your life? Aromatics Elixir Perfumer's Reserve was created as a limited edition for this cult fragrance's 40th anniversary in 2011, by IFF perfumer Laurent Le Guernec. With the wonderful rendition of the scent in the Velvet Sheer formulation, I was confident this would capture my heart, and the reviews I read on reputable blogs supported that naive assertion. With the first incensey swirl of resinous myrrh and fruity plum-like roundness and a mysterious floral back-note, I was intrigued for exactly three minutes. The intriguing opening, true to Elixir's heritage, was unfortunately succeeded by a generic, run-of-the-mill Egyptian musk accord. It was lovely in Lovely (co-created by Le Guernec and Clement Gavary), but completely out of place in this reinterpretation of a classic in the caliber of Aromatics Elixir. It takes over and dominates with a very superficial, scrubbed-clean "sensuality" that will taint my pleasure of this perfume for the remainder of it's duration on the skin. Put the musk distraction aside (if you can), and this is what you'll smell: Opening notes true to the Aromatic Elixir herbaceous powerhouse, a melange of flowers and herbs over dark woodsy patchouli and vetiver - but with a twist. Smouldering myrrh is the first hint that this is a different story altogether, and quite promising at that. 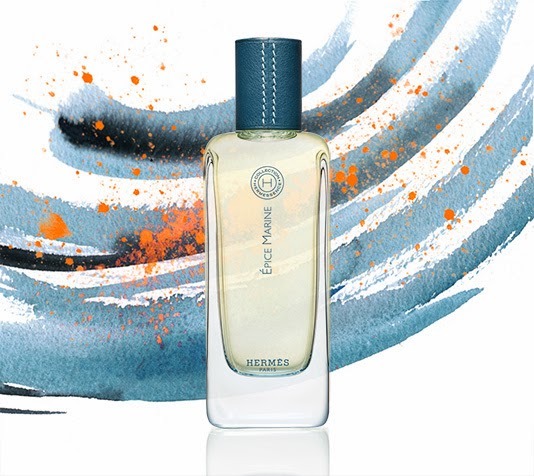 Salicilic florals come to the fore, hinting only vaguely at a velvety-fruity tuberose and a dark orange blossom absolute, but never clearly smelling like either, and this is the point in which the composition disintegrates (only a few minutes into the show). What becomes more apparent is dusky alpha ionone, reminiscent of dark plum, black violets and cedarwood. There is only a suggestion of tuberose and orange blossom, without fully developing that idea, and once the violets subsides, the perfume seems to disintegrate entirely, being taken over by the most generic and to my nose rather vile Egyptian Musk accord in the likes of Narciso Rodriguez Musc for Her Oil (a silicone formulation). Slowly but surely, you realize that perhaps it's not all that bad (meaning: not only musk pervails here, though it certainly predominates from the 3rd second): vetiver has in fact won the supporting role. And that is rather good news. It's a cleaner and leaner vetiver than that of the original, making me think that it's probably not vetiver at all, but rather vetiverol - the vetiver alcohol that gives it the distinctive green-woody-tart aroma. And sadly it is not as satisfying as the complex, smoky Bourbon vetiver of Aromatics Elixir, which gives the original its otherworldly, almost spiritual character. After several hours of very confusing development, the most surprising note of all emerges. As if by a process of reverse osmosis, lemon verbena, otherwise a rather fleeting bridge note (between heart and top) is what occupies the dry down, and for hours on end. This is definitely not something I could have predicted, and while it is a nice surprise (and much more welcome than the sickly Epygtian Musk) - it does not justify the Aromatic Elixir title. It's such a sharp shift in the plot - opposite to, say, "An Affair to Remember" which begins as a comedy and ends up dramatic if not tragic. Rather, this Perfumer's Reserve plays like a drama ending up as a comedy - a triple somersault performed by a juicy acrobat dressed up in bright orange colours alluding to Clinique's other best-seller, the ever citrusy, lighthearted and non-demanding "Happy". Cons: Despite its very characteristic opening, it is not truly worthy of the Aromatics Elixir lineage. Pros: I am probably going to keep it for the bottle regardless, and hope that it grows on me eventually - enough to run out of it so I can fill it with the real elixir. Visit NaturalPerfumery.ru to read Anna Zworykina's reviews of Espionage, Film Noir and l’Écume des Jours. Her reviews are as poetic as her perfumes! And - Gaia from The Non Blonde has included Finjan in "My Favourite Coffee Perfumes". 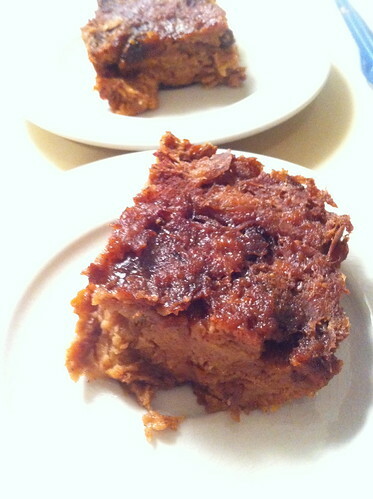 Bread Pudding, a photo by Ayala Moriel on Flickr. This is the 2nd Family Day in British Columbia - a statutory holiday that was invented last year, but sort of began 4 years ago, when the Vancouver School District slapped an extra Pro-D-Day (professional development day) on the closest day possible to Valentine's Day weekend. This holiday being quite devoid of content so far, it's time to build it up a bit. For example: change legislation about how many parents can go on one baby's birth certificate. I wish I could have had a choice in the matter when my then-husband (and daughter's father) took off, conveniently close to when her diagnosis process began... Oh well. Being over 16 and all, she no longer needs a single consent from her faux-father even if he was around. Time flies! The only people who really count are not those on paper, but those who are there to parent the child, when they get their fever high up, get all their front teeth pulled out, break their femur, and the daily communication with a non-verbal little person that only got a grip on language at the age of 8. I thank the daddy that did step into the picture and decided to remain there to support us even when our romantic partnership has ceased to exist. The weather today certainly helps in creating new traditions: constant rain after several weeks of rather dry (albeit chilly) weather. Perfect time for indoor fun such as blogging, playing card games, and baking. For those of you into baking, here's the best bread pudding recipe, which makes a perfect use of any left over white bread, challah or brioche you may have (being a small family of 2, we never manage to finish our Friday night Challah, and always have at least half left - which I freeze and collect until I feel like bread pudding again). I learned the recipe from my dear grandmother, when I first moved out of my parent's home, and she was my baking mentors for the entire time I lived in Tel Aviv. I owe her more than I can even begin to tell you - and the baking skills only scrape the surface! She turned 90 at the end of last year, and is now the proud grandmother of 6, and great-grandmother of 6 (well, soon 7!). She's truly the rock and foundation, who held the family together for many years, as my grandfather passed away many years ago. I wrote down all the staple recipes for her pastries which I love - cheesecake with pudding creme, poppyseed chiffon cake with chocolate icing, date cake, honey cake, and many more. Years later, my mom bought a book about Ashkenazi Jewish recipes, which featured a very similar recipe, but with a slightly different baking method: the pudding is baked, covered in foil, under very low temperatures, overnight. Put it in the oven the night before, and you won't need an alarm clock: you'll wake up to the sweet smell of cinnamon and apples baking in the oven... Surely a wonderful way to wake up in the weekend as well, straight into a pampering brunch that needs no additional preparations! - In the morning, remove the foil, springle with some more sugar and cinnamon, and dot with butter. Bake for another hour. - Serve warm or at room temperature. There are many ways to enjoy this simple treat: It's wonderful on its own as a breakfast affair, or with a slice or two of sharp cheese such as Cheddar or Emmenthal. Alternatively, serve as a desert a-la-mod with a scoop of real vanilla ice cream. But that's a bit of an overkill in my opinion. My personal favourite is room temperature, with homemade chocolate milk on the side. 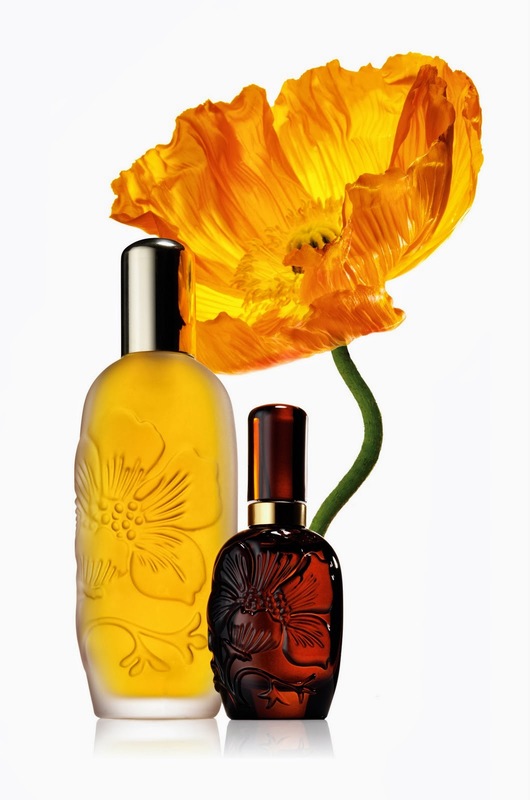 Treat your special someone and yourself to a custom-made aphrodisiac massage oil! - Design your very own blend, with those special notes to inspire passion and stir up the senses! - Take it home with you, and be ready to get pampered! * Complementary refreshments of aphrodisiac teas & chocolates will be served. Master perfumer Ayala Moriel of Ayala Moriel Parfums has been creating seductive scents since 2001. 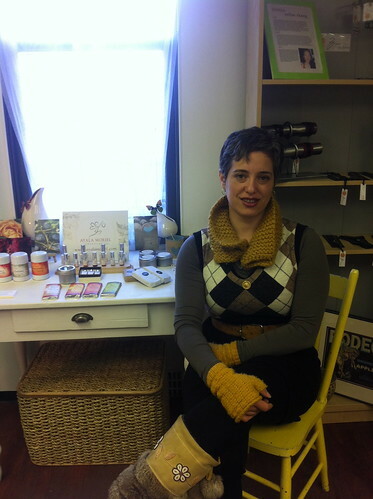 She creates custom perfumes, body products, fragrant teas, fragrant chocolates and candles, and teaches DIY aromatic workshops. $50 including all materials, equipment, packaging and the massage oil bottle you'll be taking home with you, of course! Please register with Ayala Moriel Parfums via email or call/text (778) 863-0806. 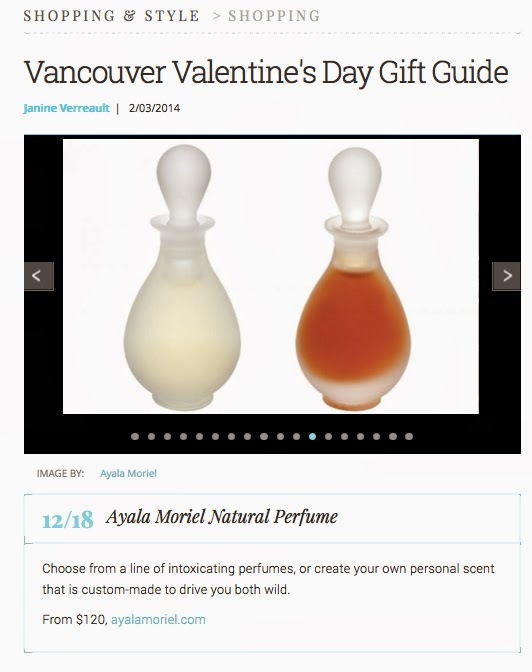 Ayala Moriel's custom perfumes and ready-to-wear fragrances have been featured on p. 12 of LivingBC's Vancouver Valentine's Day Gift Guide. Also, visit NaturalPerfumery.ru to read Anna Zworykina's peer reviews of the following Ayala Moriel perfumes: Rainforest, Schizm, Fetish and Bois d'Hiver. Anna's writing style is as poetic as her perfumes! Last but not least - some of our newest perfumes, soaps and the beard oils and hair oils are now on MakeUpAlley, so you can add your own reviews and impressions. Please do - we rely 100% on your word of mouth, and it's thanks to you, customers and readers, that I can continue doing what I do. Giving Gifts & Company, a photo by Ayala Moriel on Flickr. This week I've joined the co-op of artisans at Giving Gifts & Company (4750 Main Street @ 30th Avenue) started about a year ago as a pop-up-shop, and is now a co-op of local artisans, and sustainable products that give back to make the world a better place. It was founded by Lisa Pozin, who is passionate about giving back to the community by providing alternative, eco-friendly, fair-trade products that often donate a considerable portion of their profit (if not all) to charity (i.e. : Peace Bomb bracelets proceeds go to clearing bombs from Laos' lands; and Giving Keys is made by and therefore supports homeless people in Los Angeles; Lisa makes further donations from many of the products she sells to charities to build schools and programs for street kids in Kenya and Uganda). 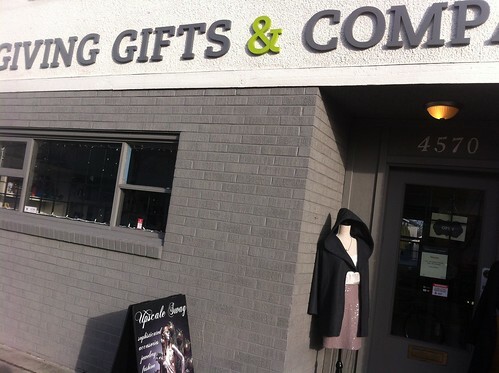 Giving Gifts is a remarkable space, with 5 showrooms as diverse as the people of this city. You'll find anything from yoga attire and trendy clothes for men and women to kitchenware, jewellery, children's accessories, toys and books, reusable snack bags, and fair-trade home-ware to vintage clothing, locally made teas, chocolates, Eco-friendly makeup, and now also natural perfumes, candles and body care products by Ayala Moriel Parfums. 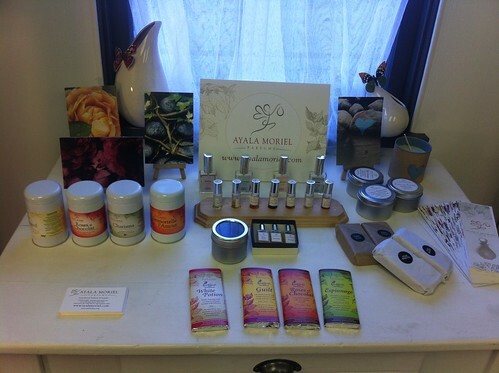 Ayala Moriel Parfums display @ Giving Gifts & Co., a photo by Ayala Moriel on Flickr. Being a co-op, means that the artisans and business owners are also the sale associates at the store. We take turn manning the place, and take pride in what we do and glad that we can support each other by sharing this space and the responsibilities of running it. Whenever I am at the shop, I will be happy to give free fragrance consultations to help you find the perfect scent for you, and the perfect gift for someone special in your life that deserves to smell good! It is also an additional spot in the city where you could pick up products you've purchased online (rather than make a studio appointment). It is the only store in Vancouver that has the wide range of products I create - perfumes, body & hair oils, soaps, candles, chocolates and teas. Ayala @ Giving Gifts & Co., a photo by Ayala Moriel on Flickr. Come visit me here this Tuesday - it will be my first shift, from 11am-3pm. 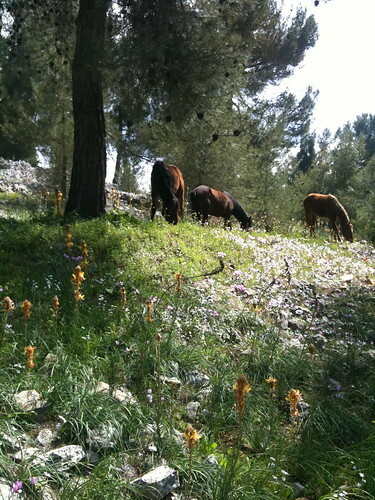 Horses & Wildflowers, a photo by Ayala Moriel on Flickr. Incidentally, we spent the first day of celebrations at the horse stables, like we do every Friday.